This tour focuses on re-examining the ancient past to find evidence of anti gravity technology in the distant past. I don't know if you believe in extra-terrestrial intelligence and that there is intelligent life on other planets, if you don't, you just might after this tour. Have you ever wondered how the pyramids in Egypt were built. Many hypothesis have been put forth as to how they built these massive monuments. None however have proven as to how they were actually constructed. Many TV shows have shown people trying to build pyramid like structures or stone structures with the tools they suspect the Ancient Egyptians used. However in all these TV shows they all failed to move these very heavy stones using ropes, pulleys, or logs, whatever the technique they used they failed. They would have us believe that it took 40 years to build the Great Pyramid. I don't know about you but I have never heard of any construction project in modern times taking that long to build. If the Ancient Egyptians were smart enough to create their own pictorial language, I doubt they were so slow minded as to build a structure for 40 years just to bury someone in it. It just doesn't make any sense at all if you truly think about it. These pyramids had some other purpose, what that purpose was is still unknown, many theories have been put forth, some day we might know for sure. Let's suppose for a little while that these ancient people had anti-gravity technology to transport the stones. That would make the entire process a whole lot simpler. The stones would be weightless and easily moved up or down or side to side. The entire construction could have taken 6 months to a year instead of 40. 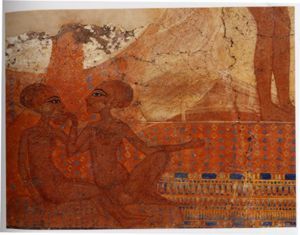 In many Ancient Egypt pictures we see an Egyptian with wings. What do you think the purpose of these wings were. Are we really to believe the crazy theories put forth by historians. That this was just an art form or a symbolic picture, signifying the flight of the soul or something to that effect. 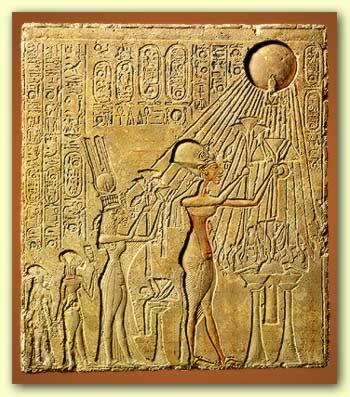 Another important symbol in Egypt was the Eternal life symbol, the Ankh. Eternal life and human flight are the products of great technology and advancement. The Egyptians also had a very efficient and complex way of mummifying their dead. How did they learn this? Modern Day Egyptians don't even know how to do this. What was their purpose of doing this? Perhaps they actually had knowledge of what happens after death. Perhaps they actually did build wings and used them for human flight, if a human were weightless and fitted with a paid of well-build wings they could actually fly like birds with great ease. Look at the next picture of another Ancient civilization that also portrayed wings on the backs of their people. 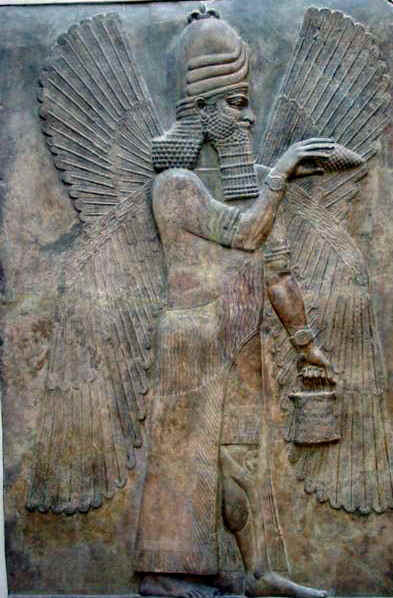 Not only does this Sumerian figure have wings, he also seems to have extraordinarily well groomed clothes with fancy embroidered patterns. He also has a fancy type of hat. This person obviously looks very smart and well groomed, much more sophisticated then historians would have us believe. He also has a bracelet which looks very much like a modern day watch. Who knows what that actually is. It just might be a high tech anti-gravity device to render it's user weightless. While I admit this sounds far-fetched, look at the next picture which is even more incredible. In this picture we see 2 Adult Egyptians. First off notice their eyes which are slender and large compared to human eyes. Next notice their 3 babies (1 is on the female's shoulders), they both have elongated skulls. On History TV shows they tell us that ancient cultures used to use ropes and weights to change the shapes of their skulls. A practice similar to tattooing or ear piercing. Let's say this were true. Would their necks also be so long and slender unlike humans? Look at both adult figures, their necks are clearly not like our's. Their hats also no doubt cover their no doubt elongated skulls. Another feature of these strange beings is their stomachs, in all pictures that contain these figures we can also notice a little pot belly on a rather slender body. Uncharacteristic of our human bodies. 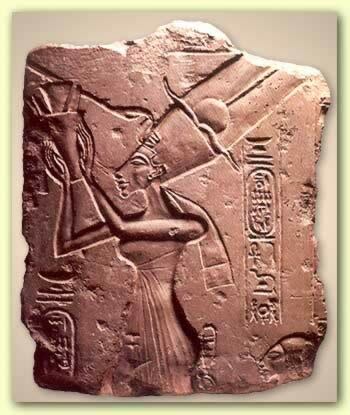 To better illustrate my point notice this next pictures of Nefertiti. 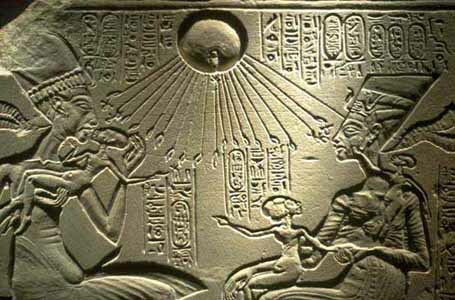 It is my opinion that there were a few of these aliens with elongated heads in Egypt. They showed the people how to build pyramids using antigravity technology.